We describe a compartmentalized microdevice specifically designed to perform permeability studies across a model of lung barrier. Epithelial cell barriers were reproduced by culturing Calu-3 cells at the air-liquid interface (AIC) in 1 mm2 microwells made from a perforated glass slide with an embedded porous membrane. We created a single basolateral reservoir for all microwells which eliminated the need to renew the growth medium during the culture growth phase. To perform drug permeability studies on confluent cell layers, the cell culture slide was aligned and joined to a collection platform consisting in 35 μL collection reservoirs connected at the top and bottom with microchannels. The integrity and functionality of the cell barriers were demonstrated by measurement of trans-epithelial electrical resistance (TEER), confocal imaging and permeability assays of 14C-sucrose. Micro-cell barriers were able to form confluent layers in 1 week, demonstrating a similar bioelectrical evolution as the Transwell systems used as controls. Tight junctions were observed throughout the cell-cell interfaces, and the low permeability coefficients of 14C-sucrose confirmed their functional presence, creating a primary barrier to the diffusion of solutes. 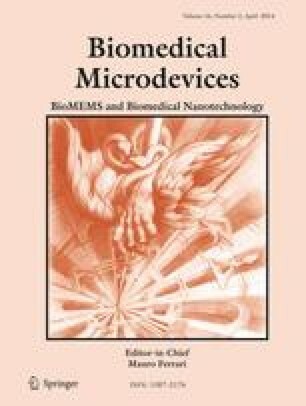 This microdevice could facilitate the monitoring of biomolecule transport and the screening of formulations promoting their passage across the pulmonary barrier, in order to select candidates for pulmonary administration to patients. The authors would like to thank Simona Mura (Institut Galien Paris Sud) for her kind help and expertise in Calu-3 cells culture, and Hélène Chacun (Institut Galien Paris Sud) for her technical assistance for radioactivity experiments. We are grateful to Gillian Barratt (Institut Galien Paris Sud) for proof-reading the English of this manuscript.